When you have a pressing legal problem in your business, you need lawyers who return your calls, who are conversant with both statutory and case law, and who understand the need for economical solutions. You want a law firm that is fast and flexible, is sensitive to high cost of addressing legal problems, and is respected in its field. 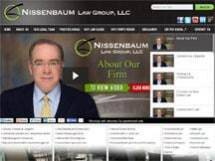 Nissenbaum Law Group, LLC, with a firm focus on complex commercial litigation, has been awarded the highest peer rating* by Martindale-Hubbell, meets all these qualifications. Our lawyers take your case legal problems and your business objectives seriously. We provide quality transactional and litigation services to firms and individuals in every industry, including health care, construction, franchising, Internet, real estate and nonprofits. In accordance with the rules and guidelines in different states, our firm has successfully resolved disputes on both the state and federal levels for business clients. Though our firm is not the largest, our team of commercial law attorneys pride themselves on response time, quality representation and successful outcomes. A cornerstone of our complex commercial litigation practice is our commitment to strive to return client calls and emails as promptly as possible. This commitment may seem minor, but it ripples through every aspect of our practice, stressing clarity and responsiveness. We never want a client to feel left in the dark about the status of his or her case. Call Nissenbaum Law Group, LLC, at 908-686-8000, and let our attorneys prove that commitment to you.